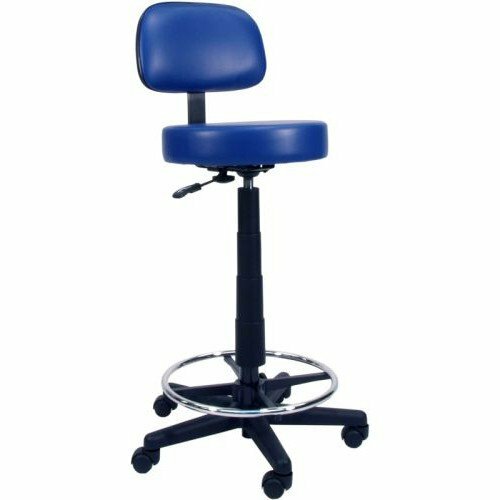 Gas Lift Lab Stool is a durable, tall swivel stool that comes equipped with an adjustable back and foot ring. Designed with a 16-Inch diameter seat, this medical stool can easily be lowered or raised with an easy-to-use fingertip height adjustment. Gas Lift Lab Stool is a swivel stool that also includes a rugged, five-star base with 2-Inch twin wheel casters, allowing it to easily and swiftly move. Tall, adjustable and firmly designed, this medical stool is the ideal accessory for any medical room or exam room. With an adjustable back and foot ring. 16-Inch diameter seat can be quickly raised and lowered with a fingertip height adjustment. It also includes a rugged five star base with 2-Inch twin wheel casters.